Running on concrete can be disastrous especially when the necessary precautions are not taken. Running on concrete means running on a very hard, unyielding surface and this can result in injuries if care is not taken. A concrete surface is at the very least 10 times harder than asphalt and if done without the right shoes that can provide the legs with good cushioning and support, it will result in undue strain being put on your lower limbs and back. The type of shoes that you should be on the lookout for when planning to run on concrete are neutral and/or stability running shoes as they possess the cushion that is necessary for your protection. The ASICS Gel-Kayano is a shoe that combines style functionality in a way that is sure to blow your mind. Add to that the fact that the price is reasonable and you will understand why this particular running shoe comes as the best on this list. The Gel-Kayano 24 model has been in existence for over 20 years. And the fact that this model is still among the most loved running shoes around is a testimony to its excellence. One of the reasons for this is its overpronator technology which imbues it with increased stability and comfort. The rearfoot and forefoot are made with GEL brand technology which means that the feet are well protected from shock during impact. About 86% of those who use the shoe says it fits as expected. This is no mistake as the materials used to make the upper part can adapt to fit the size of the foot. 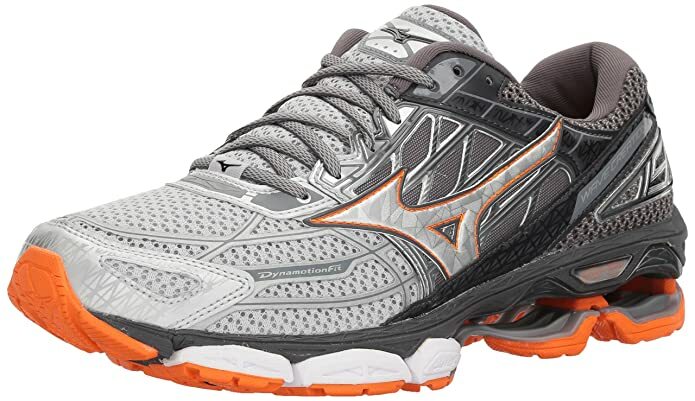 This pair of shoes by Mizuno is another running shoe that provides incredible quality for its price. Made from textile and synthetic materials, it is adaptable to the shape of the wearer’s foot. This means that orders of this product will be true to size. It has a rubber sole which allows for easy cleaning of dirt and mud; soft cushion which provides great support while running as well as protects the foot against the impact of the hard concrete floor; a full-length U4icX bottom midsole for flexibility and a host of other things. For its comfort, its beautiful design, and many more, this shoe comes in second place. 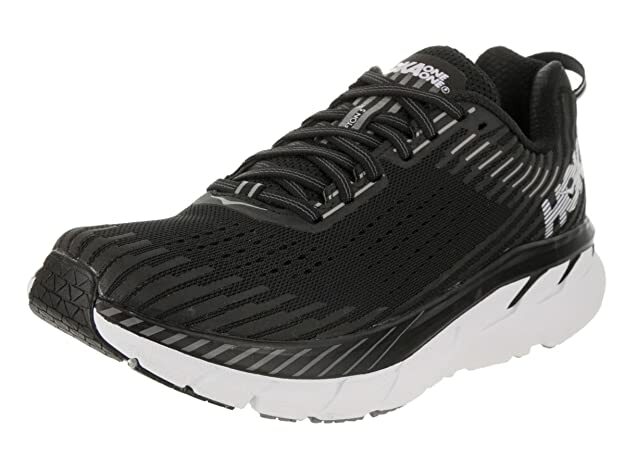 The Paradigm 3 Road Running Shoe is the cheapest running shoe for concrete I have personally come across. Do not underrate this shoe, however, as it is every bit as effective as even the most expensive shoe on this list. It is built in such a way that you can use it on different surfaces. It comes with a guide rail that will ensure that your foot is well steered when you wander off track while running. 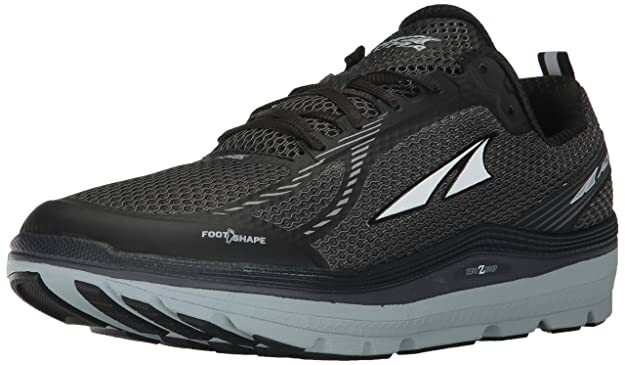 Also, the upper part of this running shoe features a mesh and a bunion window in a combination that will provide you with utmost support and comfort. If you do not mind spending a lump sum of money on something quality and comfortable, then, the Bondi 5 Running Shoe by Hoka One One is something you should definitely go for. With a price that ranges from $120 to $399, it is one of the most expensive running shoes you will find around. It is certainly the most expensive on this list. This shoe is worth every cent it costs, however, as it offers comfort as you have never experienced before. This particular version is the most recent of this line and most of the features have been improved upon. 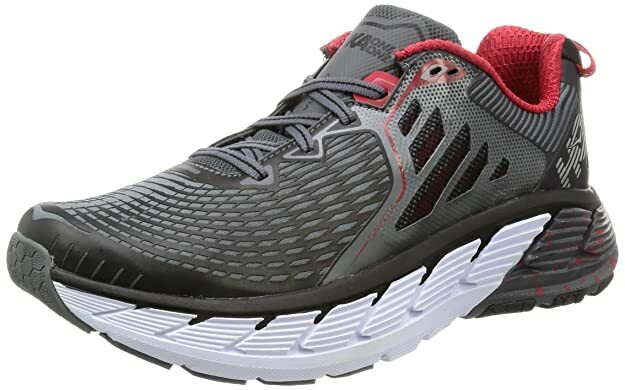 The Gaviota Running Shoe is well suited for running long distances and for long periods of time due to the durability which is as a result of Hoka’s new J-frame technology. Apart from this, the shoes are very comfortable and provide a great deal of support for runners no matter the length. They do not scratch the ankles, are very flexible and are also easy to clean. This is not surprising though as Hoka One One has established itself as a brand that can be trusted for quality products. If you are a heavy runner, these shoes should come really high on your ‘to-buy’ list. The Gel Cumulus Running Shoes are yet another testament to the superior innovation of ASICS. With a design that was inspired by the Northern Lights, this pair of shoes are beautiful, stylish and very fashionable. This shoe features aesthetic appeal, functionality and great pricing in a balanced, hard to achieve way. This is why I have chosen it as the best product in this article. The Gel Cumulus 20 Running Shoe provides the user with the utmost comfort and support. It also fits snugly and is true to size which eliminates the stress of going to the store to check it out before buying. If what you are looking for is a running shoe that provides great value at a moderate price, then, this pair is for you. When it comes to wears, Brooks is a household name which is not a surprise considering the fact that they have consistently delivered quality products over the years. 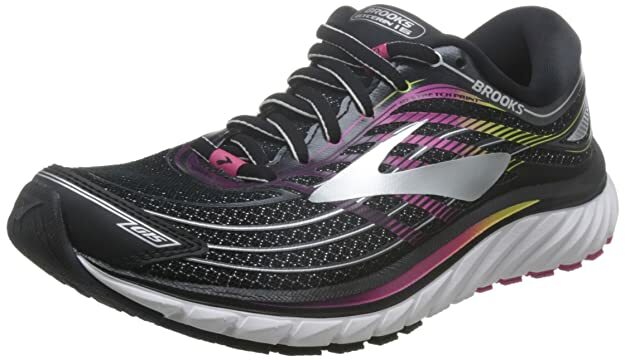 The Glycerin 15 is yet another testament to Brooks’ dedication to providing their customers with quality, comfortable wears. These shoes have a synthetic sole which enhances the durability. You can run in them for a long time and still feel as comfortable as the moment you set out because of the well-cushioned footbed among other things. Combine this with the price and you will find out that it provides great value for the price paid for it. That is why it is my pick for the second-best women shoe. You definitely won’t regret spending your money on this. 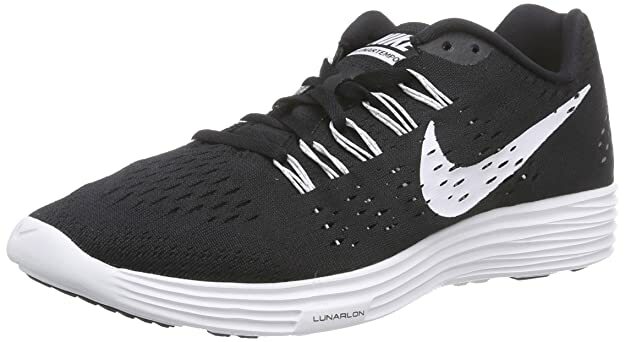 This Lunar Tempo Running Shoes by Nike is one of the most functional pair of running shoes you will find around within the price range of $30 – $125. They are very lightweight which makes them exceptional for running long distances. The ventilation and breathability are great which helps keep the shoes dry thereby enhancing the comfort of the user. Although the shoes are not true to size, the combination of high-quality mesh and Flywire cables allow the user to adjust the shoe as required to get a snug, comfortable fit when the right size is gotten. In all, it is a pretty well put together pair of shoes for someone with a low budget. 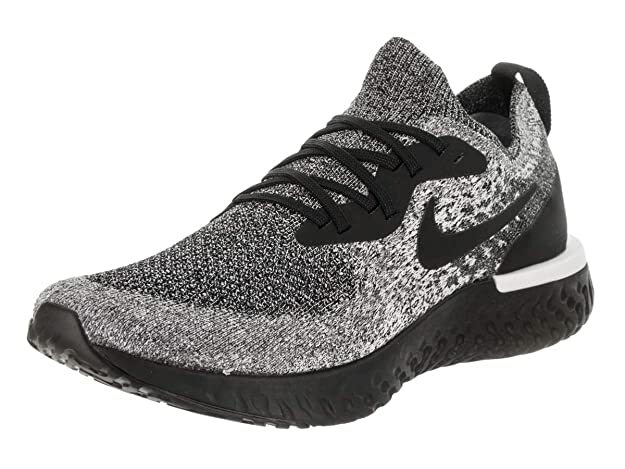 Nike is one company that is reliable for producing quality wears and the Epic React Flyknit Running Shoe is not an exception. This pair of shoes has an upper part made of fabric and a rubber sole both of which make cleaning very easy. The upper part of the shoe utilizes a Flyknit construction and elastic yarns which make the shoes secure, supportive and well fitted. And with the use of Nike’s React foam technology for the midsole, you get a soft, well-cushioned feeling when using the shoes. The shoe also features a premium style that is bound to make you the cynosure of all eyes during our runs. And while it is very expensive, the comfortability and functionality that you will derive from it make it worth it. Hoka’s Clifton 5 Running Shoes are a step in the right direction for this model. They are super light which makes them awesome for running fast and for long distances. It features several technologies which enhance the comfortability and supportiveness of this pair. The sole is very soft and well padded; this helps cushion and absorb the shock that is to be expected when running on concrete. Also, the upper mesh is breathable and snug with the breathability allowing the shoes to remain dry such that it does not harbor bacteria. This pair comes highly recommended for those who not love running but also loves running long distances. In a world that has billions of people all with different physiologies, it is only natural to expect that differences in what each person’s needs are. A 50-year old man with plantar fasciitis will definitely have a need for a shoe different from what a young man with absolutely no injuries will have. The following is a guide on how to choose the best running shoes for concrete based on your particular need. The first step towards choosing the best possible concrete running shoes for your personal use (or anybody’s for that matter) is to determine the kind of foot strike you have. Like, are you a forefoot runner, a midfoot runner or a heel striker? The kind of runner that you are will help you determine which particular running shoe will provide the most comfort and support for you while running. One sure and very simple way of determining the strike you have is to observe the sole of a running shoe you used to use. Check the three different sections, that is, the heel, the middle and the front; whichever of the three sections has worn out the most indicates the kind of strike you have. What do you consider the most important while running. Are you about covering as much distance as possible, running as fast as possible or even being as comfortable as possible? Which is your highest priority? If your highest priority is speed, then, you will need a very lightweight shoe at the expense of comfort. This is because a shoe that is very light will not have as good a cushion as other shoes. If you place a higher priority on distance, then, you should be looking at getting a shoe that provides optimum support for your ankles and feet so that your run won’t result in blisters and aches. And if the most important thing to you is comfort, you should acquire a shoe that is well padded and cushioned although at the expense of the shoe being heavier than most. Yet another factor you need to consider when choosing the best concrete running shoe for yourself is your reason for running in the first place. Are you running for sport; for recovery after surgery, or injury; or are you running to train? If your reason for running is training, you will need a shoe that is very durable. That is, you will need a running shoe that will last for a long period of time. This is due to the frequency with which you will use the shoe. If the shoe is meant for sport, your focus will definitely not be on the durability (although it does matter) but on support and comfort. And if your reason for running is recovery, then, you will require a shoe that has a lot of cushioning. This is so as not to worsen your situation and to allow you to heal. Would you be comfortable wearing brightly colored concrete running shoes or neutral colored ones? Would you prefer a sleek, streamlined design or something more officious looking? Your preferences matter and they should definitely be factored in when you are considering which shoes to buy. So, you should take a moment to decide on what features you want your concrete running shoes to have before deciding on which to buy. Read what other people say about a shoe you have an interest in. While choices differ which means that not everybody will have the same opinion of the shoe, you will, at the very least learn one or two things you did not know about the shoe which will influence whether you buy it or not. As mentioned in the introduction to this article, concrete is very hard and if care is not taken, the impact of the feet on it can result in injuries. This is why it is important that a shoe you plan to run on concrete with should have good adequate cushioning to protect the feet. Flexibility is another very important for a running shoe bound for concrete floors. This is because a stiff, inflexible shoe will result in the feet having blisters. You need a shoe with a good fit if you want to run comfortably and without any mishap. Whether you are new to running or you are a veteran, the shoes in this article are the best running shoes you can find around especially when you will be running on concrete. They all have adequate cushioning which will protect your feet from the impact you are bound to experience when running on a concrete surface, they fit well and snugly when the correct size is acquired and they are very flexible. That is to say that they tick all the boxes of what you will expect in a good running shoe for a concrete surface. 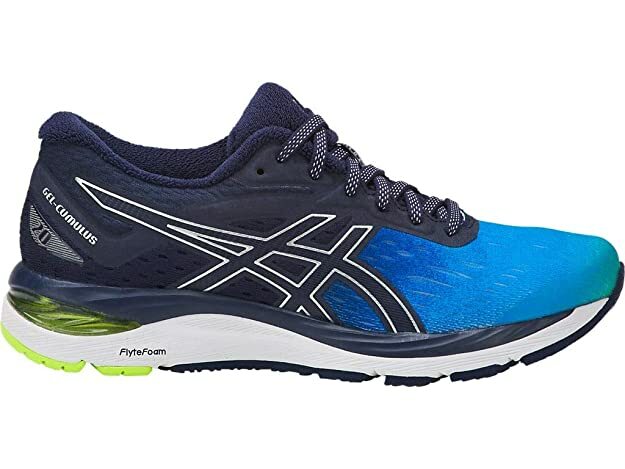 The ASICS Gel-Kayano 24 Running Shoes is by far and above the best men’s running shoe you can get your hands on, however. ASICS has done something really unique with this shoe as it combines lightness and incredible cushioning. This makes it ideal for a lot of purposes. No matter your reason for running, the ASICS Gel-Kayano 24 Running Shoes is certain to help you fulfill it. 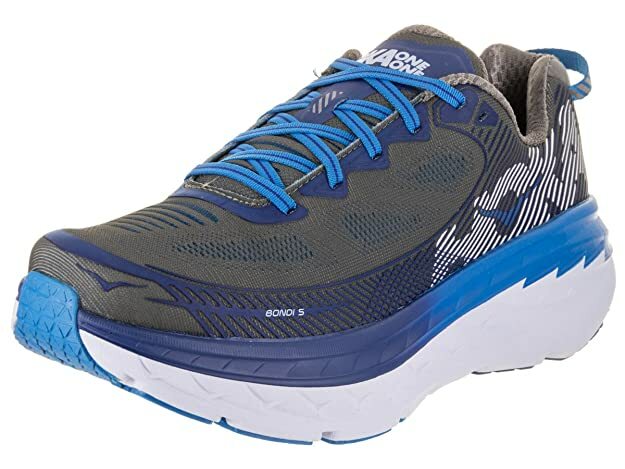 Combine this with a price that is reasonable with all the benefits this particular pair of shoes provide and you are sure to understand why I have chosen it as the best men’s running shoe. 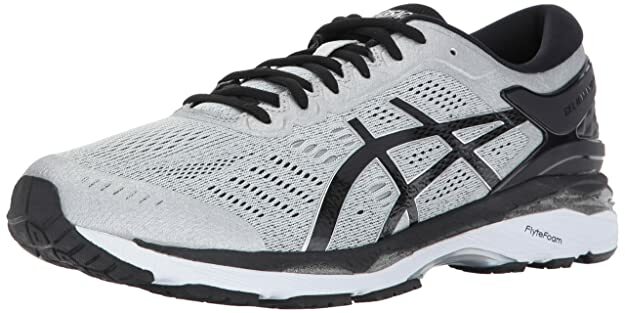 For women, the best running shoe around is ASICS Gel-Cumulus 20 SP which, just like its male counterpart, also provides optimum comfort although it isn’t as light. At the price it goes for, I am quite sure you will find no other running shoe suitable for concrete that is as amazing. This is why I have chosen it as the best women’s running shoe and you would be doing yourself a disservice if you have an opportunity to buy this shoe and choose another.